Many articles will state that blue is an appetite suppressant. It's true that there isn't much of a natural occurrence of the blue color in foods, and some people go so far as to dye their food blue in order to make it more unappetizing. But can the same idea be applied to the kitchen? 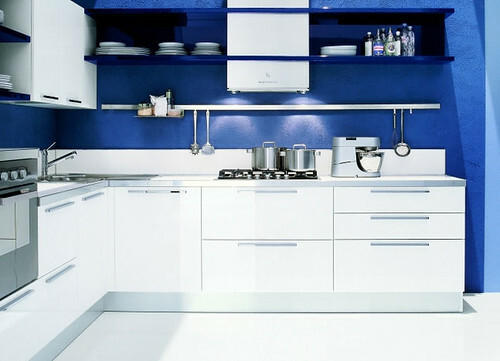 Will a blue kitchen make you less hungry? In the same vein, some argue that warm colors, like red and orange stimulate the appetite, pointing to fast food joints and restaurants often sporting warm color schemes as evidence to this effect. But will a red kitchen make you eat more? We raise the question to our AT readers: if you've got a blue or red kitchen, do you feel like the color affects your appetite? Did you choose that color based on its reputation, or just because you liked it? Help settle the dispute by sharing your own kitchen color experiences!